Nikon has launched the D610, a 24.3 megapixel FX format DSLR with improved continuous shooting speed. Nikon has announced a new FX format DSLR, the Nikon D610, and update to the Nikon D600, it features quicker continuous shooting at 6fps, and a new quiet shutter mode. 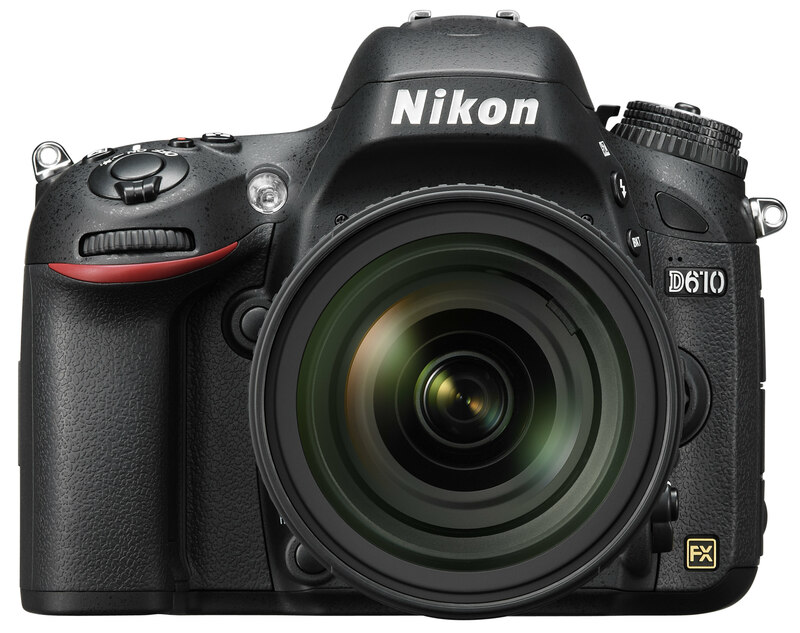 The Nikon D610 will be available from 18th October 2013, priced at £1799 body only or £2299 with 24-85mm kit lens. From Nikon: An exciting option for those who are ready to take the next step in their photographic journey, this 24.3-megapixel D-SLR allows keen photographers to develop their skills and define their style whilst enjoying the superiour image quality that comes with the FX-format sensor. Full frame, full detail, full freedom: The 24.3-megapixel FX-format image sensor captures every detail with lifelike sharpness, and continuous shooting speeds have increased to 6 frames-per-second (as compared to the camera’s predecessor, the Nikon D600). Nikon’s new Quiet Release burst mode allows you to shoot in near-silence at 3 fps, and a robust, lightweight build allows photographers to explore the advantages of full-frame in any environment. Combined with the optical prowess of NIKKOR lenses, the Nikon D610 is a superb option to explore new realms of creativity. Hiro Sebata, Product Manager for Professional Products, Nikon UK, said: "We’re excited about the creative possibilities this camera has to offer thanks to its fast, powerful processing and impressive feature set that includes ‘quiet shooting’ for when you need it most. Plus, its solid yet lightweight design and stunning image quality makes this camera a serious choice for photographers looking to step into full-frame photography." For those ready to take their photography to the next level, the D610’s 24.3-megapixel FX-format CMOS sensor will open up new worlds of photographic depth and detail. From true wide-angle to super telephoto, the sensor captures every element with lifelike sharpness at up to 6 fps. Offering outstanding levels of detail and tonal range, plus superb low-light capability, the Nikon D610 captures images that are sharp, and video quality is impressive even at higher ISO settings. The ISO range goes from 100–6400, and is extendable up to 25,600 (equivalent) or down to 50 (equivalent) for maximum flexibility in all lighting conditions, whether shooting still images or video. Faster than its predecessor, the Nikon D610 shoots up to 6 frames-per-second (6 fps) in both FX and DX formats, making it easier than ever to capture fast-moving subjects. For situations when silence is key, Nikon’s new Quiet Release burst mode reduces the sound of the camera’s mirror return mechanism, so it’s easier to capture elusive subjects, such as wildlife, at up to 3 fps. 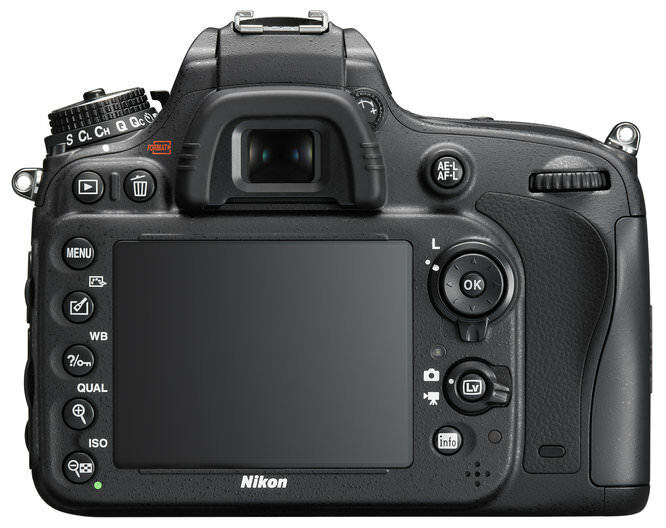 Highly sensitive autofocus system: The Nikon D610’s Multi-CAM 4800 39-point AF system boasts AF sensitivity inherited from Nikon’s flagship D4, enabling superior subject acquisition in any light. Compatible with lenses up to f/8 combined open aperture, and sensitive down to -2 EV (ISO 100, 20 °C/68 °F), the AF system achieves sharp shots even under moonlight. Coverage is individually selectable or configurable 9-, 21-, and 39-point settings, and AF modes such as dynamic-area AF and 3D-tracking maintain focus on even the smallest subjects, however unpredictable their movements may be. Simplified selection of AF modes such as AF-A, AF-S, and AF-C is possible without taking your eye away from the viewfinder. Advanced Scene Recognition with 2,016-pixel RGB sensor: The Nikon D610’s Advanced Scene Recognition system incorporates Nikon’s renowned 2,016-pixel RGB metering sensor that meticulously analyses each scene for outstanding accuracy. It can detect human faces with startling exactness through the optical viewfinder, and recognise a scene’s colours and brightness with unprecedented precision. This level of detailed scene analysis is also utilised to support more accurate autofocus; auto exposure and i-TTL flash exposure results in a diverse range of compositional and lighting situations. EXPEED 3 image processing: Equipped with the same image-processing engine as Nikon’s flagship D4, the Nikon D610 makes light work of data-rich tasks without sacrificing speed and quality. The 16-bit image processing offers richer colours and tones than ever before, delivering smooth gradations with abundant detail and tone all the way up the scale to pure white, even when shooting in JPEG. Full-frame D-Movies: Broadcast quality video - Designed to ensure large-format movie shooting at its best, the Nikon D610 features the same multi-area Full HD D-Movie as found in Nikon’s acclaimed D800. Since the camera offers a wide variety of movie applications, a comprehensive variety of frame rates, and convenient custom controls—which enable full control over live view operation when filming—photographers can move from inspiring stills to broadcast quality video with ease. Frame rates: Full HD (1080p) movies can be recorded in 30p, 25p, and 24p, with 60p, 50p, and 25p options at 720p. Full HD movie clips can be up to approximately 29 minutes 59 seconds long. Multi-area mode: Full HD (1080p) recording is possible in both FX and DX formats, enabling exceptional freedom of expression. High-fidelity audio control: With the Nikon D610, movies sound as good as they look. A microphone jack allows use of an external stereo microphone for crisp sound recording, and there is an audio out for external headphones. Uncompressed HDMI output: The Nikon D610 offers the possibility to transmit an uncompressed live video stream at 1080p to external recorders, and output will automatically drop to 1080i if an external monitor is detected. The uncompressed data is output at the designated image size and frame rate, and is clean of the information overlay that can be simultaneously displayed on the camera’s TFT monitor. Time-lapse shooting: Create time-lapse photography through simple menu operations, with no need for elaborate calculations and editing. Easily save images as movie files and view slow action in fast playback, with playback rates from 24 to 36,000 times faster than normal. Use interval timer shooting to trigger the shutter at preset intervals. HDR (High Dynamic Range) mode: shoots one overexposed and one underexposed frame in a single shutter release. The range can be widened by up to ±3 EV for different looks, full of saturation and tonal gradation, while the smoothness of the edg­e where the two exposures meet can be adjusted for a more natural appearance. Picture Controls: Customise the look of your stills and videos by fine-tuning parameters such as sharpness, saturation, and hue. This feature can be directly accessed via a dedicated button. Scene modes: 19 scene modes optimise settings such as shutter speed, ISO, and aperture for superior results every time. An ideal way to quickly capture perfect shots. In-camera editing: Menus include an array of useful features, encompassing options to correct red-eye and colour balance, as well as D-Lighting, RAW processing, and resize options. Filter effects include Skylight, Cross screen, Miniature, Colour outline, Colour sketch, and Selective colour. Quick retouch options include distortion control, perspective control, straighten, and fisheye. There is also an movie editing feature that enables the start and end point of movie clips to be designated in order to save them more efficiently. Built to withstand severe conditions, the lightweight Nikon D610 boasts the same robust build and responsive handling as its predecessor. Durable magnesium alloy is used for the camera’s top and rear frames, and the camera is weather-sealed to the same degree as Nikon’s professional D800 SLR, ensuring enhanced resistance to moisture and dust. The camera’s fast response, reliable operation, and conveniently placed buttons and controls enable smooth, comfortable handling and the flexibility to respond quickly to even unexpected shooting opportunities. For more information, take a look at the Nikon website. Anyone want to buy a Nikon D600 complete with oily sensor so i can get my wallet out to buy another camera, one with a quieter shutter !! Nice looking camera, but what market is it really aimed at? 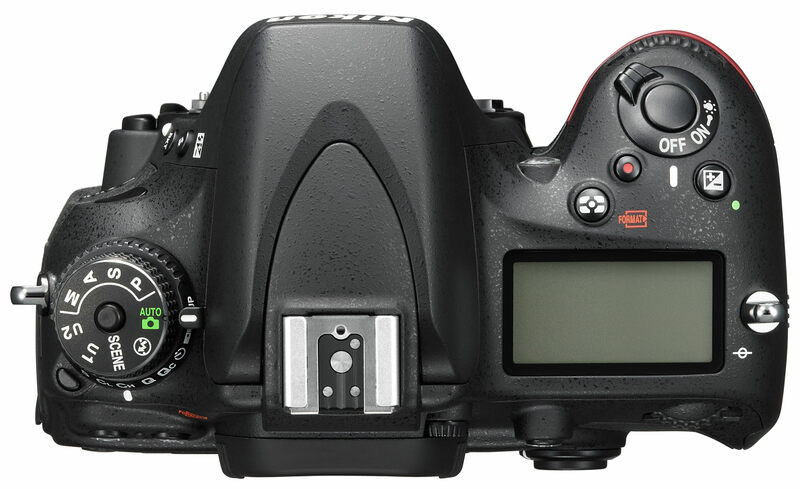 At the advertised price it isn't far short of the current price of a D800, so which would you choose? I feel that Nikon have shot themselves in the foot again. Nice looking camera, but what market is it really aimed at? At the advertised price it isn't far short of the current price of a D800, so which would you choose? I feel that Nikon have shot themselves in the foot again.